to be used for daily devotions (like “Our Daily Bread” and other daily readings). 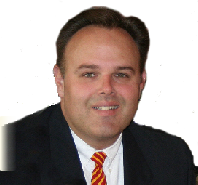 I want to give you enough information to make sure that you are an informed buyer. to understand what I write (I think that’s important, and I’m quite sure you’ll agree!). denomination. Now, let us commence with the Review! Even a casual visit to a bookstore will impress a viewer with the many “how-to” or self-improvement books that are available today. How to be happy, be healthy, be successful, be a good parent … and the list goes on. But what are the “how-to’s” for an effective spiritual life? Are there daily practices that Christians should pursue? First and foremost, there needs to be an appreciative awareness of God’s amazing grace in our lives: grace that adopted us as sinners and made us members of the heavenly kingdom; grace that sustains and directs our daily steps; and the grace that will ultimately usher us to our eternal home. A daily life of praise, thanksgiving, and the adoration of God. A daily life of prayer, fellowship, and a communion with God. A daily life of love, a delight in the personal assurance of God’s love and a desire to share His love with others. Two basic resource books are available to help us in this spiritual well-being: the Bible, and the church hymnal. Regular study of the Bible, God’s infallible rule of faith and practice, is an absolute essential for Christian living. Nothing ever replaces our daily need for His trustworthy Word. Through the ages, however, devout believers from every Christian community have responded to God and His inspired revelation with their own expressions. The church hymnal, a most important heritage of the Christian church, is one of the finest collections of man’s thoughts and feelings about God. When these choice responses are further enhanced with appropriate melodies, harmonies, and rhythms, there exists a reservoir of unusual spiritual strength and encouragement. As an old fashioned conservative, let me say “Amen!” Osbeck gets it like few contemporary authors do. The two most important books to just about any Christian ought to be The Bible and their church hymnal. Osbeck’s Amazing Grace bring them both together. The best part of this book is that it is formatted for a daily reading every day of the year. So, while it is a book that many people could sit down and simply read straight through, it will be much better taken in small increments - every day throughout the year. So - this is a Daily devotional book. I think the subtitle helps the reader to understand that there are 366 (one day for leap year, too) readings, one for each day of the year. But it is not just a haphazzard collection. Each month focuses on two or more devotional topics. Example: January focuses on hymns relating to Guidance, Aspiration, Prayer & World Evangelism. Some of January’s hymns are: “Guide Me, O Thou Great Jehovah,” “What A Friend We Have in Jesus,” and “Jesus Saves.” A treasury of the familiar makes these devotional readings exciting indeed! These pages are power packed! Not only will each day’s reading give you “the rest of the story” as to the background of the hymn, but Osbeck skillfully - and rapidly - moves to powerful devotional application. Each day’s reading also includes relevant scriptures, and hymn lyrics with music. Oh yeah - and each day is one page. One. Are you going to tell me you don’t have time to read that? The hymn selection is clearly traditional, and not contemporary. Those looking for a CCM style of music will be disappointed; those looking for “Holy, Holy, Holy” and “Leaning On the Everlasting Arms” will be delighted! With Osbeck’s many other titles, you might think, “What’s the point of this one? Hasn’t he already said all there is to say about these hymns?” Glad you asked! 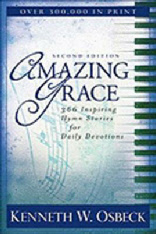 Amazing Grace keeps its focus on Daily Devotionals. It is not a history book; it is a devotional book first. While it does reference the back stories of our beloved hymns, he is writing to draw you closer to God; not to give you a history lesson on hymnology. And he does this very well. As this sprightly carol reminds us, Christmas should be the most joyous season of the year for all true Christians. Our lives should be filled with gratitude to God for the immeasurable love shown to us in the gift of His Son. Out of joyous hearts we should be exuberant in “heart and soul and voice!” This ancient hymn uses frequent repetition to impress upon us that the birth of Christ won for us “endless bliss” by opening the way to heaven and conquering our fear of death through His assurance of eternal life. The festive spirit of Christmas, however, should not fade away as the holiday passes. The joy and peace that Christ brings to our lives should enable us to be continually rejoicing Christians, regardless of the circumstances. The blessings that came to us on Christmas morn have illuminated our lives forever! I give this book a “Great Resource for Everyone Rating” - which is basically my top rating for a book like this. It’s hard to imagine it being any better. It truly is inspiring in it’s daily readings. If you like this kind of literature, you’ll want to check out Osbeck’s other books that are written with a similar methodology. Amazon.com offers 21 reviews (as of December, 2012). Read them here. This comprehensive review is by Dr. David S. Thomason. Copyright 2012. All rights reserved. This is a real treat for all hymn lovers. It focuses on a daily devotional thought tied to the background of famous hymns. Complete with Scripture verses and lyrics, this is sure to be a real blessing to your walk with God.